God’s ways are not our ways; they’re much better. (Isaiah 55:8-9) The story of Ahaz, Pekah and Rezin is a perfect example. King Uzziah’s grandson, Ahaz, was twenty years old when he became king and, like many young men that age, he thought he knew better than his elders. Both his grandfather, King Uzziah, and his father, King Jotham, walked in the ways of the Lord. Ahaz, on the other hand, rebelled from the start. He worshipped every idol available on the high places. (2 Kings 16:1-4) Worst of all, he burned his infant son to death as a sacrifice to an idol and led the people of Judah to do the same. Burned his baby son. Pause to consider this for a moment. Ahaz was about as bad as it gets. Pekah was the king of Israel at the time and every bit as bad as Ahaz. He formed an alliance of war with Rezin, king of Aram. The two kings decided to make war against Jerusalem in order to capture it but could not defeat the city. They camped in Ephraim as a launching spot for their army in anticipation of more war and the ultimate takeover of Judah. Of course, the news spread like wildfire. The Judean people were terrified and their hearts shook like trees in a windstorm. Ahaz was as frightened as anyone. “Oh, no,” Ahaz told Isaiah. “I wouldn’t dream of testing God by asking for a sign.” Hw didn’t mind testing God by burning his son alive in the arms of a huge metal idol, but he refused to ask for a sign. Here’s the remarkable part. Wicked Ahaz wouldn’t do what God said, despite a personal message from God Himself, but God was not dependent upon Ahaz’ willingness to obey. He had something to say and He said it, even if no one wanted to listen. Are there any more precious words? There is no situation so bleak, nothing we face, no fear we have nor disease we contract that can stand in the presence of Jesus. Immanuel. God with us. At one of the darkest moments of his life, the encouragement God gave Ahaz is the same He gives us today. Emmanuel. God is with us. We need not fear. Jesus has come and the world will never be the same again, nor will we, His people. 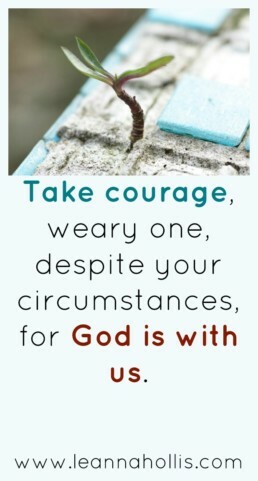 He is with us no matter what we face nor how difficult our circumstances. His presence, dear friends, is always enough. Awesome words of encouragement! Thank the Lord He gives us what we need and not what we deserve! Amen, sister. And thank the Lord He doesn’t always give me what I think I want.